I can only assume the writer was trying for y’all, but slipped the apostrophe in the wrong place. The Southern expression y’all is an contraction for ya (or you) all. The contraction ya’ll is short for you will. Come on people! It’s “y’all”! 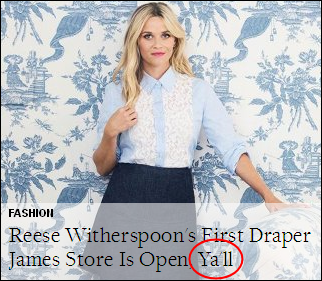 It’s “y’all”, not “ya’ll”. And don’t waste your time telling me any different. If you don’t think readers don’t notice your mistakes, y’all are kidding yourself. If y’all are trying to spell the Southern expression you-all, try y’all. If you’re trying to spell a contraction of you will as if spoken by a Southern, try ya’ll. The contraction ya’ll — if it even exists — is short for you will. What y’all wrote is a contraction of ya (or you) and will. That’s not y’all intended, is it? What does your writing say about you? If you write for Yahoo! Shine, it says a lot. And most of it is not good. This says, “I still have no idea how to use punctuation, and I’m willing to settle for ‘close enough. '” Y’all is right about “close,” but for a professional writer, that shouldn’t be good enough. Y’all take care now, ya hear?